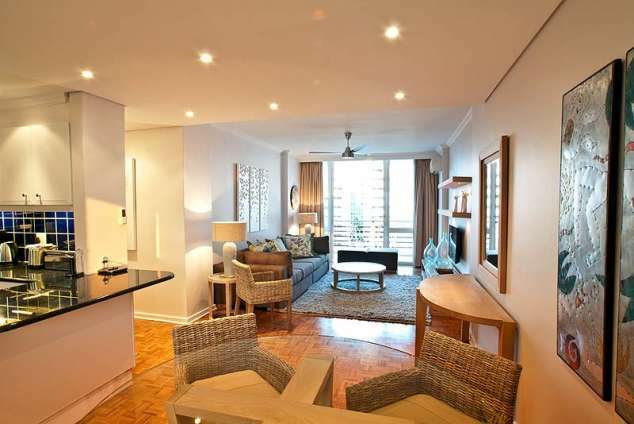 506 Lighthouse Mall - Umhlanga Rocks Accommodation. Off the lounge are sliding doors onto the patio with views of the sea. Sit on the patio and listen to the sounds of the ocean whilst enjoying your sundowners or that cup of coffee in the morning. A gas Weber braai (barbeque) is provided on the patio. The modern kitchen has granite tops and is beautifully appointed and fully equipped. There is also a microwave oven, under counter oven and hob as well as a washing machine and tumble dryer. FREE Wi-Fi internet access is provided. The apartment has satellite TV (DSTV) as well as a DVD player. There are ceiling fans in the apartment. The apartment is serviced daily except on Sundays and public holidays. Secure double undercover parking is provided for your vehicles. Airport transfers can be arranged. Please note that this apartment is not suitable for young children. 506 Lighthouse Mall is in the heart of the Umhlanga Village. There are numerous hotels in the immediate vicinity where children can enjoy ten pin bowling, game arcades etc. Enjoy a walk along the 5 kilometre Promenade on the beach or a stroll along the nature trail through the Hawaan Forest. There are several family and up market restaurants in the village centre. 506 Lighthouse Mall is so ideally situated, one can virtually park your car at the beginning of your holiday and have no need to use it again for your entire stay. 506 Lighthouse Mall is a five minute drive from Gateway, (the largest shopping centre in the Southern Hemisphere), twenty minutes drive from Durban, the International Conference Centre (I. C. C.) and U Shaka Marine World. King Shaka International Airport is a fifteen minute drive from Umhlanga Rocks. There are several fine restaurants in the village or at Gateway Shopping Centre. A private first world hospital is a five minutes drive away by car. There are several world class golf courses in the immediate vicinity including the prestigious Mount Edgecombe and Zimbali courses. 34904 page views since 10 Sep, 2012.